A stunning morning launch of STS 131. – Digital Recruitment and me. 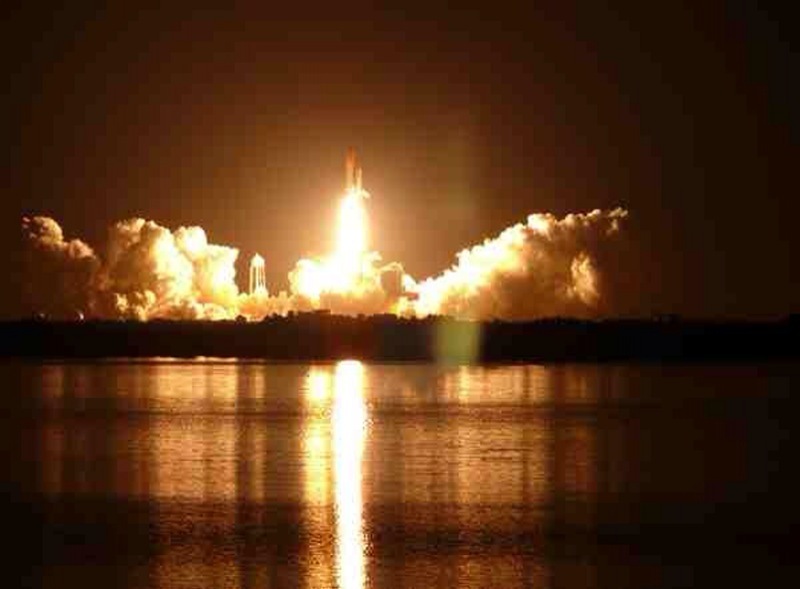 A stunning morning launch of STS 131. Nathan, James, Bethan, Gazza and I witnessed a wonderful morning launch. We arrived in Orlando on Saturday around 3PM and as our minds were still in UK time (5 hours ahead), we decided to mosey on down to Titusville on the Monday morning, waking the children and setting off at 4:45AM. Although it was early, everyone was very much awake and looking forward to the potential launch. The only issue we were concerned about when we set off was the possibility of patchy fog interrupting the launch (or obscuring our view) and the weather experts put the chance of this at 20%. That became our secondary issue when we hit stationary traffic on the 528 out to the space coast with only 50 minutes to go. By the time we reached the outskirts of Titusville, we had only 10 minutes spare which wasn’t helped by a series of red lights and dense traffic. We dashed anxiously to the waterfront of the Indian river with only about 2 minutes spare and I managed to find an empty layby right next to thousands of people looking Eastward. We jumped out of the car and jostled into position just in time to witness the sky turning a bright browny, orange. No noise at this stage but as we watched the Discovery power up over the early morning sky, the ground started to shake very eerily. Suddenly the sonic boom resonated around the Titusville area followed by what I can only describe as a loud fire crackling noise as the orbiter surged higher into the atmosphere curving over the black ocean as it continued its journey. Gazza unfortunately got the wrong button on the video camera and so (like the shuttle), his footage was destined for the ether but I managed to take various shots with the iphone and a bit of video for what its worth. Before we jumped back in the car, there was a huge round of applause across Titusville as the solid rocket boosters detached and spiralled away from Discovery towards the Atlantic clearly in view. STS 131 was on its way to the space station and we were now on our way back to Orlando munching on iced donuts and drinking coffee, chatting at the awesome sight we had just witnessed. There are only 3 more shuttles to go before they finally retire in 2010 and with NASA unclear of the replacement vehicles at this stage, it might well be some time until I get to witness another manned rocket launch at KSC. Previous Previous post: The Book has arrived! !